New York:(APS) Foreign Minister Shah Mehmood Qureshi has said that Pakistan will continue to strive for achieving the international goals in collaboration with the international community. Addressing the 73rd Session of the United Nations Ge-neral Assembly in New York, he said that Pakistan will continue to support the comprehensive reforms in the Security Council and wants to see it more democratic and transparent. He said that Pakistan has been an active member of the United Nations since its inception and is at the top of the list of countries, which participate in the peace keeping mission of the United Nations. Foreign Minister said that Pakistan wants to have friendly relations with the neighboring countries. 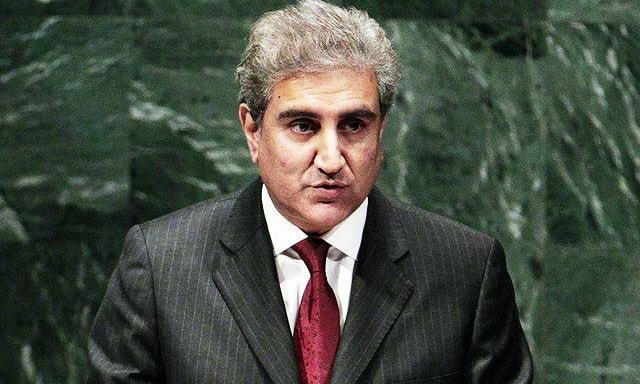 Shah Mehmood Qureshi said that Pakistan wants to resolve outstanding issues with India through dialogue but the Indian government has wasted an opportunity for the third time. He said that unresolved Kashmir dispute poses great threat to peace and stability in the region and peace can never be established in South Asia unless the issue of Kashmir is resolved in accordance with the UN resolutions. He said that India must stop human rights violations in the Occupied Kashmir and stop ceasefire violations at the Line of Control. He said that India will face a severe reaction if it attempted any misadventure against Pakistan. Shah Mehmood Qureshi said that India has been sponsoring terrorism in Pakistan and Indian spy Kulbhushan Jadhav was involved in planning and sponsoring terrorist activities in Pakistan on behalf of Indian government.